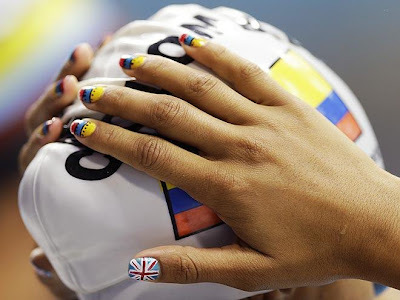 Fashion also plays its part at Olympics2012.From side braided pony tail to Neon shoes.From bold lip colors to perfectly drawn nail art.Fashion is everywhere at this year Olympics Games. 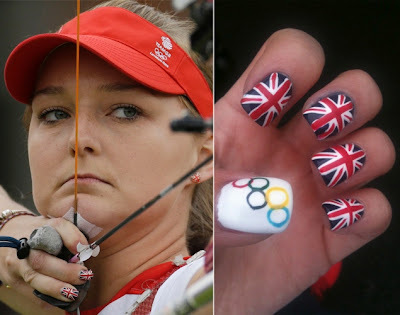 In this post,We are going to look at some fabulous piece of nail arts from London Olympics Village. The lady behind this colorful trend is Shoby Robson.She with a bunch of London Nail Artists on behalf of P&G saloon provides manicure service for sport personalities and guests at the Olympic village. 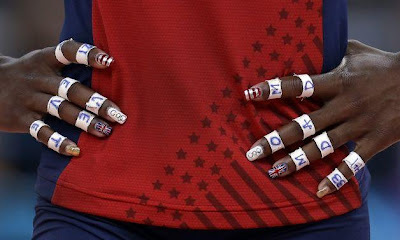 Its good to know how athletes support their own country. The nail arts are so cute especially the flag of Great Britain.